People in Nipa arrived in thousands to see their sons nominate to contest the 2017 National Elections under PNC banner. 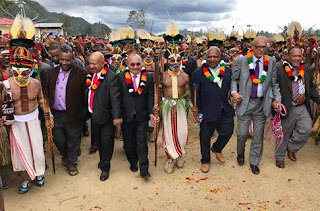 Jeffrey Kopal nominated to defend his seat in the Nipa - Kutubu Electorate, while Governor William Powi also nominated to defend the Southern Highlands Regional Seat. Prime Mininster Peter O'Neill with his powerhouse PNC candidates who were there for the commissioning of Nipa Hospital and Electricity also witnessed the nomination. While in other news, Writs for Papua New Guinea's 2017 National Election were signed today, kicking off the official period for the country's five-yearly polls. PNG's Governor General, Bob Dadae signed and issued the writs at Government House in Port Moresby. With this formality, the nomination period began. 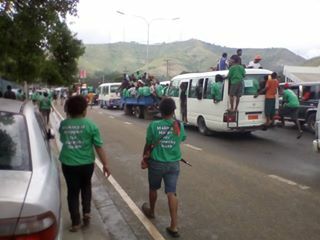 Some parts of Port Moresby city were in chaos as supporters of intending candidates took to the city streets.